A great event for all those who enjoy the high energy of contra and square dancing with a great caller and scintillating band! This is an intensive but fun week for dancers of all levels of experience. If you are new to Contra but have experience in other dance styles you should find you learn rapidly; if you’re an experienced dancer there should be plenty to keep you interested! 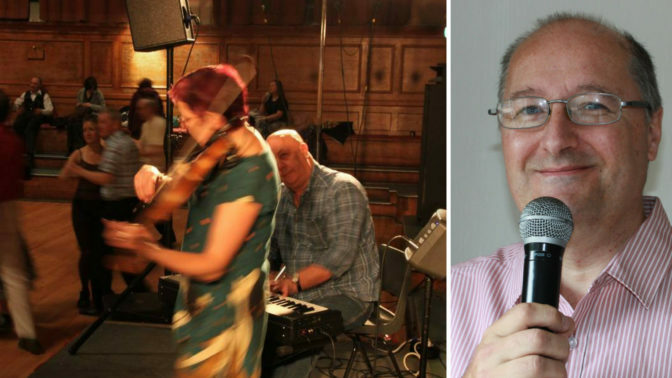 Geoff Cubitt is well known as a caller for American Squares and Contra and English Ceilidh and is well respected among his peers. He has considerable experience as a dancer himself, particularly in Appalachian dancing, performing at many festivals.His experience as a dancer stands him in good stead when calling, as his sympathy with those on the floor means that he is helpful to beginners as well as extending the expert dancers. The English Contra Dance Band is a two piece band, based in the UK, who have for the last ten years played at most of the major contra dances. Linda Game plays a driving fiddle style over Gareth Kiddier’s solid piano accompaniment. Although they are from different traditions, English traditional and Rock, they have adapted very well to the American high energy style of contra dance music. As a dancer recently said, “How can two people make so much noise!”. In the last few years they have played at many major festivals in the UK, including EIFF, IVFDF, Sidmouth, Chippenham, and Towersey, as well as dance weekends at Halsway Manor. They regularly perform at contra clubs up and down the UK, and have worked with most of the top UK callers. In recent years they have played at festivals in Denmark, where there is a strong contra community. In 2012 they had their first US tour, playing for American contra dancers on the East Coast.